You Goofing Off? 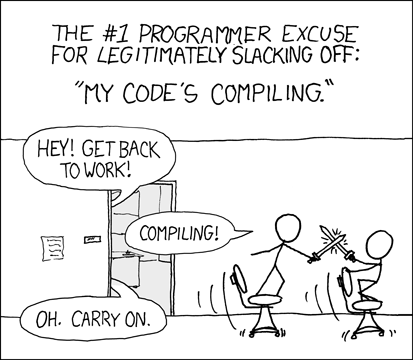 No, I’m Compiling! Posted April 23, 2013 by vansunder & filed under Technology, Work. Now that I’m getting back into real coding again (not just html & CSS) I’m being reminded that a large part of coding, especially when you’re new to a language and make a lot of mistakes, is waiting for code to compile. I’d say that I don’t mind it, but that wouldn’t be true. I’m so much busier these days than I used to be. As a result, every minute of compiling feels like a wasted opportunity. For that reason, I’m keeping a lot of smaller tasks handy so that I can be productive even when I’m waiting. Since I work from home these days, those tasks can vary from reading up on the tech news to household chores, depending on how I’m feeling and how long I think I have. The key thing for me is that I’m not twiddling my thumbs. Lost time feels like a horrible waste these days since I have two kids and free time is a rare luxury that should not be squandered. I’m thinking I might actually fit some exercises or meditation into these forced breaks. Whatever I end up doing, it will be a heck of a lot more productive than sitting around watching my computer compiling code.